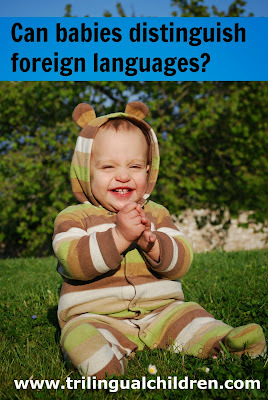 Google+ Raising a Trilingual Child: Can babies distinguish foreign languages? A friend of mine, who is an avid traveler, asked me after visiting another country were people speak a language he could not understand: "How do children feel about hearing a foreign language? Can they understand that it is a different language they hear?" According to the University of British Columbia psychologist Janet Werker, bilingual infants (infants, who were raised in households where two languages were spoken), were able to distinguish foreign languages one from another though facial cues, even before anybody spoke those languages to them. Monolinguals also have the ability to distinguish two languages; however, it does not last long, only until they are 6 month old. Patricia Kuhl, Professor of Speech & Hearing Sciences at Washington University, says in her talk "The linguistic genius of babies" on TED, that "babies all over the world can discriminate all sounds of all languages no matter of what country they were testing and what language were using." However, "by the end of the first year, the infant brain is no longer universally prepared for all languages, but instead primed to acquire the language(s) to which the infant has been exposed", Patricia Kuhl and Maritza Rivera-Gaxiola write in the paper Neural Substrates of Language Acquisition published in The Annual Review of Neuroscience 2008. According to Werker, Canada Research Chair in Psychology and director of UBC's Infant Studies Centre, "The task of language separation is something they (children) are prepared to do from birth – with bilinguals increasingly adept over time." As parents we should not worry about our newborn children learning multiple languages. They are prepared for this task, which is often not easy for adults. The children's brain works different than ours, and they do not feel overwhelmed as we do. We should not be afraid to start teaching them languages. Read also an interview with Janet Werker, which was conducted by François Grosjean in the article "How do Bilingual Infants Separate their Languages? Language discrimination and separation in bilingual infants"
The Best Way to Start Building Your Bilingual Child's Vocabulary Is by Taking Your Baby On a Stroll. Thanks so much for this informative post! I totally agree that babies are so much better equipped than we are- but no reason for adults not to learn new languages too! Fascinating studies that confirm what I observed with my two children. Early on they were able to distinguish French and English, had two separate babbling/nonsense word patterns as their language progressed, and now, as preschoolers, understood the concept of multiple languages. May the research forge on, supporting our efforts!